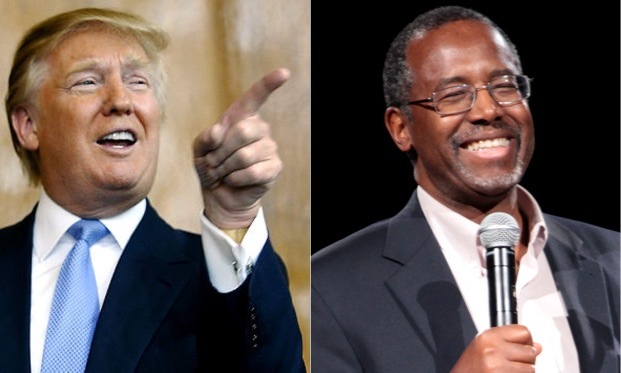 Republican Presidential Candidates Donald Trump and Ben Carson. He’s dead politically, he’ll never be president of the United States, ever. By definition I don’t think you can be a front-runner if you’re totally un-electable. I think there’s there an a-priori logic problem in that. So that’s great news for Jeb. Because if you discount the front-runner, and the runner-up to the front-runner, and Cruz and Rubio and whatnot, then the real front-runner is Jeb, who’s totally electable even if no actual electors want to elect him. Why is that? March 1, yeah. And so how do you turn enough money on to actually get on the air fast enough to have an impact? Well, what does 1,400 points—decent, well-targeted points—cost in the March 1 states? About 26 million bucks. So it’s over. It doesn’t matter who wins Iowa and New Hampshire because on February 10th whichever loser has won is gonna need 26 million bucks and, even if he comes in twelfth, Jeb is the only one who’ll have that because he has “inspired so many people to donate to us”. He hasn’t inspired so many people to vote for him. Indeed, given the way his numbers have cratered over the summer he may now have more donors than voters. But, as Mike Murphy sees it, it’s the donors that matter. Jeb Bush, once a front-runner for the Republican presidential nomination, is slashing pay across the board for his struggling campaign as he attempts to regain traction just 100 days before the party’s first nominating contest. The campaign is removing some senior staff from the payroll, parting ways with some consultants, and downsizing its Miami headquarters to save more than $1 million per month and cut payroll by 40 percent this week, according to Bush campaign officials who requested anonymity to speak about internal changes. Senior leadership positions remain unchanged. The campaign is also cutting back 45 percent of its budget, except for dollars earmarked for TV advertising and spending for voter contacts, such as phone calls and mailers. Some senior-level staff and consultants will continue to work with the campaign on a volunteer basis, while other junior-level consultants, primarily in finance but including other areas, will be let go, the officials said. The officials declined to say who would be removed from the payroll or provide an exact dollar figure for the savings. Maybe Mike Murphy is right. He is, after all, something of an expert at picking general-election losers – which Jeb would certainly be if Murphy’s donors were to drag him across the primary finish line. Neither Jeb nor his bazillions of staffers have any improvisational wit, which is why Trump has amused himself all summer needling him as “low-energy” and then, when Jeb displays a flash of anger in return, congratulating him: “More energy! I like it.” Jeb has apparently now decided to spend the fall talking about his brother. Then Donald Trump turns up. He has an issue, but it’s the one the consultant class advise you to go nowhere near with a ten-foot pole, so he snaffles it up all to himself. He spends nothing on ads, because he’s sucking up all the free airtime in the 15 minutes between the stupid irritating soft-focus commercials. His biggest expense is hats and T-shirts. He has no endorsements from former senators and former congressmen and former this and former that, because they’re losers and nobody remembers who they are. Not being a career politician, he feels no need to pretend to be an average working stiff, because he’s not. And the consultants’ response to all this is to complain that Trump’s not doing it right. Then Ben Carson comes along. In the first debate, he says nothing except one cute non-political soundbite two minutes before the end, and his poll numbers go up way higher than all the senators and governors who are alleged to have performed well. In the second debate, he doesn’t even bother with the cute soundbite: He stands there on CNN for three hours saying nothing, and he rockets up the rankings into second place. Then, like Trump, he starts saying things that are supposed to destroy his candidacy – about Islam, guns, the Holocaust, whatever. Instead, they propel him into the lead in Iowa. At which point he puts his campaign on hold and goes off on a book tour. Murphy calls Trump a “zombie frontrunner”. That term applies more tellingly to Jeb in the months before Trump entered the race. Last night, in an interview with Megyn Kelly, Bush shrugged off Trump’s poll numbers, pointing out that at this time in the last cycle Herman Cain was in the lead. But this isn’t the summer of 2011, when Cain and Rick Perry and Michele Bachmann all enjoyed their moment in the sun. Trump has outlasted all their respective reigns combined. The real zombie, as he and Carson have correctly identified, is the Republican nominating process, which was a dead husk staggering around observing obsolete and ineffectual rituals that benefit only Mike Murphy and a few other alleged kingmakers. Both men recognized that it was ripe for the hijacking, and, in demonstrating how weak and enfeebled the entire racket is, they have performed a useful public service. As for Jeb, let’s see how he does next Wednesday. The problem isn’t the ad budget, it’s the dog food. But he inspires the donors, so who needs voters? Published Oct. 24, 2015 at SteynOnline.com. Reprinted here Oct. 29 for educational purposes only. May not be reproduced on other websites without permission from Mark Steyn. 1. What is the main idea of Mark Steyn’s commentary? 2. The purpose of an editorial/commentary is to explain, persuade, warn, criticize, entertain, praise, exhort or answer. What do you think is the purpose of Mark Steyn’s commentary? Explain your answer. 3. Tone is the attitude a writer takes towards his subject: the tone can be serious, humorous, sarcastic, ironic, inspiring, solemn, objective, cynical, optimistic, encouraging, critical, enthusiastic… Which word do you think best describes the tone of Mr. Steyn’s commentary? Explain your answer. 4. Do you agree with Mr. Steyn’s assertions about Jeb Bush and the Republican primary? Explain your answer.